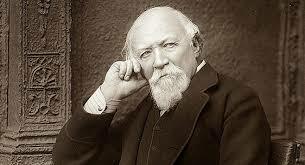 Rabbi Ben Ezra was first published in 1864 as one of the poems in Robert Browning’s Dramatis Personae. Like many of his other poems in the collection, this one has a 12th-century scholar Abraham ibn Ezra as its narrator. In the poem, the Rabbi is speaking to an unknown audience about the beauty of each age in human life and the problems associated with them. Rabbi Ben Ezra opens with the rabbi addressing an unknown audience about the beauty of old age. He demands people to join him in the process of getting old and embracing the changes that old age is causing to their bodies and mind. In order to explain his point in a better way, the Rabbi tells his audience that youth is certainly the most glorious age of the life of a human being. However, he points out that no person has experiences of life when they are in their youth. Old age is a mixed blessing because even though it will take away the vitality and strength that one possesses as a youth, it will give a person more experience about life and they can use this experience to develop a better understanding of the world around them. Rabbi Ben Ezra continues and says that old age is a golden period of one’s life. It is because as people grow older, they understand the nature of God more accurately. This allows them to be closer to Him and accept the faults that they have in themselves. He claims that young people have a spirit which helps them to have big dreams and aspirations. In order to make these dreams come true, young people become merciless towards everything and want to see the physical consequences of their actions immediately. On the contrary, when people grow older, they start to understand that the desires of the flesh are also a part of human needs and they are given to us by God. This realization helps people to embrace their faults and make better decisions in life. Towards the end, he concludes his observations by stating that all human beings are a part of a bigger whole, even though they are never able to see it as one. He says that as people mature in age, they start to develop a realization of this whole which brings them closer to God. When a person is young, they have bigger dreams but old age teaches people to be satisfied with what the world is offering and be grateful to God as everything we have is His gift to us. 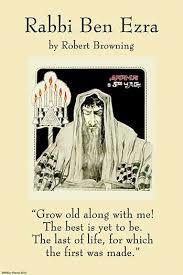 One of the most read poems of Browning, Rabbi Ben Ezra is often celebrated for its philosophical ideas and complexity. The basic philosophy of the Rabbi is paradoxical, which he explains with the help of an evaluation of the merits and demerits of youth and old age. On one hand, he claims that human beings are a small part of a bigger idea and human life is nothing but a small step in the journey of the soul. Contrary to this idea, he says that as people grow old, they become wiser and learn to accept the world as it is, which implies that human struggles are not of much consequence in the long run. Browning is seen struggling with a common philosophical issue in the poem- is youth better or old age? He claims that young people are energetic and want to achieve everything as fast as they can. However, when people grow old, they gather learnings about the world and become more accepting of the things that surround them. Both of these are important in their own way, but which one is worth more for a human being? However, he is not giving an ultimate resolution to this problem, he claims that an old person has the maturity to embrace everything that they gain experience. They can treat happiness and sadness as equal emotions because both of them are a part of our identity as human beings. Old age teaches a man to be happy because old people have experienced unhappy times. As people grow old, they get closer to death and start to appreciate the value of life. However, when people are young, they want to achieve everything in order to be happy and are not patient or content with what life offers them. Through the example of Rabbi Ben Ezra, Browning tells his readers that happiness and sadness are beyond our control. However, experience teaches us to bear both of them which is why people should join the Rabbi in the process of getting old.